How to purchase Vizros Plug-ins? Download and try for free. You can use the unregistered version of Vizros Plug-ins without time limit. All features are available. But the marker "Vizros Plug-ins" will be added to images generated. After registration this limitation will be canceled. Register the software online if you like it. The registration fee is $19.95. You can pay through PayPal. After you finished the online registration process, a registration key will be sent to you by email immediately. To register, launch Adobe Photoshop, open an image, and select "Filter->Vizros 4->Register". 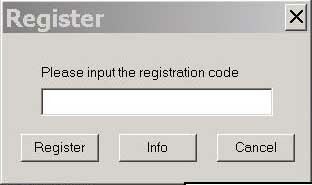 Input the registration key and click "Register". The registration process is similar if your host programs is Paint Shop Pro, Photoshop Element, or others. Figure 1. Register Vizros Plug-ins. How to purchase Vizros Explorer? Download and try for free. You can use the unregistered version of Vizros Explorer without time limit. All features are available. But Vizros Explorer downloads only half (up to 20) of the images from each site. After registration this limitation will be canceled. After you finished the online registration process, a registration key will be sent to you by email immediately. To register, launch Vizros Explorer and select "Help->Register". Input the registration key and click "Register". Figure 2. 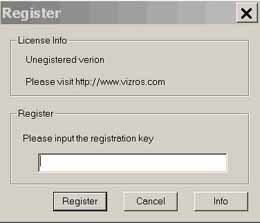 Register Vizros Explorer.